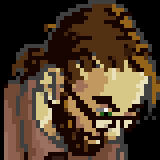 We make Game Development Progress Reports on Fridays, and occasional blog posts at random! Make sure to follow us to stay up-to-date! I can’t remember exactly when it was that I came up with the idea for it (It was March 9th), but at one point I had an idea that I thought was amusing pop into my head. 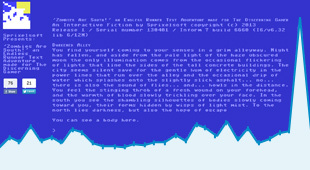 An Endless Runner Text Adventure. Not to rag on the endless runner genre… but there’s something about the endless scrolling screen of games like Canabalt, Robot Unicorn Attack, Temple Run that fails to captivate me. And so I felt that a spoof was in order. Enter the concept behind our April Fools 2013 game, “Zombies Are South!” which was launched on April 1st. Matt and I had joked about the idea of making some text adventures in the past, and honestly I think it’s still something we might put some more effort into at some point. This game however was admittedly rather rushed as by the time I was committed to doing something for April 1st, I only had a few hours at my disposal to try and whip something up. That means that unlike Matt’s work with Super Hematoma, I certainly wasn’t about to come up with a game engine from scratch. It would have been nice to have randomly occurring areas to add some variety to the game play. While I think the joke gets across that it’s an “Endless Runner” as is, it may have been more interesting to actually have some variety to the running rather than being able to spam “run north” endlessly. It would have been nice to have timed events so that if you took too long to enter your run command in, the zombies would catch you and the game would end. It would have been nice to have a -real- score board. The death message that reads: “Keep Trying! The Top Score belongs to: Einar Ulfson – 7,405,926”? Fake. There is no score keeping. I just wanted to throw something in there to egg people on into playinig more than once and questioning whether there was more to the game than just running endlessly. There isn’t. The number comes from an Yngwie Malmsteen song, and the name Einar Ulfson is an in joke that will hopefully become clear some day in the distant future. And then obviously came the need to release the game for the public to be able to play. Setting up a sub-domain and uploading the files to the ftp was obviously a menial task, as was editing the css and html files to get the old school look, but surprisingly I had a lot of difficulty getting the “share” buttons working. There was a bit of a conflict with the game code and the share code which took me a while to find a solution that would work, but in the end it took 13 hours to do that small little joke! Maybe it’s a little odd that our “first game” ended up being a quick joke project. And strangely enough, while I was thinking that it really was just a joke, it was exhilarating to get something out there and be wondering how it would be received. I admit I had a tough time sleeping as I kept having delusional dreams that it had gone viral and was being shared all over the internet. A little disappointing to see that wasn’t the case, but as you can see from the graph I superimposed on the featured image, we did get a nice little traffic spike on April 1st. It was a neat little project!